The Bridgepoint Active Healthcare campus was expanded in 2003 to include the former Don Jail. In 1875, the House of Refuge (later renamed Riverdale Hospital) opened at the corner of Broadview Avenue and Gerrard Street East. The hospital took on its current name Bridgepoint Active Healthcare in 2002, and later expanded to include the former Don Jail in the Bridgepoint Redevelopment project. The 1884 annexation of the area then called Riverdale included an area from the Don valley on the west to Greenwood on the east, and from Danforth on the north to Queen Street on the south. Riverdale is located just east of Toronto's downtown core. Since its amendment to the City of Toronto in 1884, it has developed a stature as a neighbourhood of independent arts, with several independent galleries located along Queen Street East. The residential landscape within Riverdale is made up primarily of Victorian and Edwardian style homes, constructed in the 1800s as boarding rooms for the working-class. Many of the residences have since been redeveloped into homes for young families with homes redesigned to fit the tree-lined streetscape. In recent times, local housing values have increased significantly. With this a new generation of young professionals and their families have moved into the area, furthering already widespread gentrification. A residential area in "Upper Riverdale". Houses north of Riverdale Avenue are typically newer, and renovated compared to the homes in "Lower Riverdale". "Riverdale" can refer to a smaller area or a larger area around it as well. The smaller, core area of Riverdale refers to the stretch of Toronto east of the Don Valley Parkway and west of Jones, between Danforth Avenue (north) and Gerrard Street (south). This area is occasionally referred to as "North Riverdale" or prime Riverdale. "Riverdale" sometimes is used to refer to a much wider area that includes "South Riverdale" and less frequently areas east of Jones. This area includes many smaller communities, usually centred around a 'high street' or commercial area. Erected in 1893, Broadview Hotel is located in Riverside, an area of South Riverdale. "South Riverdale", as its name suggests, is the southern half of the Riverdale neighbourhood, south of Lower Riverdale. Its approximate boundaries are: the Don Valley Parkway to the west, Jones Ave. to the east, Gerrard Street East to the north, and Lake Shore Boulevard to the south. "Riverside", also known as the "Queen Broadview Village" is a neighbourhood located within the larger neighbourhood of South Riverdale. Definite boundaries according to the Riverside Business Improvement Area defines the borders as the Don River to the west, Gerrard Street East to the north, Empire Avenue to the east and Eastern Avenue to the south. The Ralph Thornton Community Centre is a local landmark in Riverside. Riverside is a mixed income and multicultural neighbourhood currently experiencing a trend of "gentrification" along Queen St. East and Broadview Ave. It had been home to the Don Destructor, a Toronto garbage incinerator which was demolished in 2004. Don Mount Court, a social housing project was recently redeveloped as a mixed social housing and market value community. The market value portion is being sold under the name Rivertowne. Riverside is known for its many historic buildings and rich cultural heritage. The biggest landmark in the neighbourhood is the Broadview Hotel, a red sandstone commercial block in Romanesque style constructed in 1891-3, that was the tallest structure in South Riverdale for many decades. Other major landmarks include the Ralph Thornton Community Centre,(Queen Saulter branch Toronto Public Library) Broadview Lofts, and The Opera House. Riverside was also the location of Sunlight Park, Toronto's first baseball stadium. The area has a large young population, evident in the cluster of schools just east of Broadview Avenue. Dundas Junior Public School is the resident school for children in kindergarten through to fifth grade, after which they are transferred to Queen Alexandra Sr. Public School which sees students through to eighth grade. It is also home to the First Nations School of Toronto, a cultural survival school that places heavy emphasis on aboriginal values and culture, and SEED Alternative Secondary School, Canada's first public alternative school. Riverside is rapidly emerging as a district of independent design, furniture, and food retailers, as well as restaurants. Toronto's second largest Chinatown, also known as East Chinatown, is located north of Riverside, around Broadview Avenue and Gerrard Street. Toronto's second largest Chinatown, also known as East Chinatown is found at Broadview & Gerrard. At the northernmost corner of East Chinatown (northwest corner, Broadview Avenue and Gerrard Street) is the Riverdale branch of the Toronto Public Library. This branch is bilingual in Chinese and English. North of the library is the monument to Sun Yat-sen. Construction on the Toronto Chinese Archway began in the western end of East Chinatown on November 24, 2008 and it opened to the public on September 12, 2009. There are only two streets with bilingual signs (English on top, Chinese on the bottom), Broadview Avenue (百樂匯街) and Gerrard Street East (芝蘭東街), and signs located three of the four corners of the intersection. Kempton Howard Park is a municipal park located in Blake-Jones. "Blake-Jones" is a section of tree-lined streets with residences built from the 1870s to 1930s. The neighbourhood extends along Jones Avenue commencing at the cemetery south of Strathcona and extending down to Hunter. It is bordered by Danforth Avenue to the north, Pape Avenue to the west, Greenwood Avenue to the east and the CN Railway tracks just south of Riverdale/Boultbee Avenue to the south. Houses along Blake Street are more affordable in this neighbourhood than in many areas of the city because most of the homes are semi-detached. There are also a significant number of residents within public housing, residing in apartment and townhouse complex of Blake/Boultbee, owned by Toronto Community Housing. With a 33.3% unemployment rate in youth aged 15–19, the Blake-Jones corridor of Riverdale has seen an increase in crime in recent years. There are three local elementary schools zoned to the area; Blake Street (which also houses East end Alternative), Earl Grey, and Pape Avenue. The high school that is zoned to the area is Riverdale Collegiate Institute. The neighbourhood is served by the Pape, Donlands, and Greenwood subway stations and the 72 Pape and 83 Jones bus routes and is also home to the Greenwood Subway Yard, a landmark within the area. Located within Blake-Jones is an area residents refer to as "The Pocket". Over time there have been some differences on the exact definition of the area, but currently the Pocket is understood to be "accessible only from the west along Jones Avenue". This would indicate that the area would be bordered by Chatham Street at the north (which itself is not accessible from Jones, except by bicycles on the recently created bike lane), and on the southern end by Boultbee Ave. The Eastern side is bordered by the TTC Greenwood yard. As of January 2013 the Pocket Community Association declared they served an area that is "bounded on the west by Jones Ave, on the east by Greenwood Avenue, on the north by Danforth Ave, and on the south by the railroad tracks abutting Boultbee Avenue in Toronto, Ontario, Canada. The community is served by the Pocket Community Association. Located in the southeastern portion of Blake-Jones, Greenwood Yard is a rail yard with support buildings that service subway vehicles of the Toronto subway system. The name "The Pocket" was created by area residents during a planning session attended by Susan McMurray, also an editor of a newsletter for the area. The name has stuck in part because of the "village feel" of the community, and has become well used by residents and realtors in the area. The Pocket has been experiencing a gentrification similar of that to the most of Riverdale and other neighbourhoods within Toronto. For The Pocket, this started in the 1990s. The neighbourhood is listed as one of the ten hottest areas in Toronto Life and is described as "coveted" by the Globe and Mail indicating that buyers will pay a premium to live in the community. The Pocket has an above average number of people from the Muslim and Greek Orthodox communities living in the area. The area has benefitted from a strong group of volunteers who have done much to make the area safer and prettier. Such projects as cleaning up and renaming Ben Kerr Lane, an annual street party on Dawson Avenue, street sales, organized pot lucks, not to mention a great number of improvements to Phin Park. Phin Park has had a number of mature trees planted along its central lighted walkway, an outdoor ice rink created every winter, the placement of large boulders removed during street work, and the building of a gazebo next to the playground for parents to cool off while their children play. Throughout the year there are events at the park organized and paid for by the community including monthly movie nights and an excellent fireworks show on Victoria Day. Another beautification project included building a small orchard and community garden area north of the Greenwood TTC yard. The area bounded by Dundas St. East in the south, Jones Ave. to the east, the railway tracks to the north, and Carlaw Ave. to the west is also referred to by local residents as "Badgerow," after a residential street that runs through the centre of that area. This pocket includes the legendary Maple Leaf Tavern, as well as a Sikh temple, Turkish cultural centre and Jewish cemetery, in addition to the Gerrard Square shopping mall. Riverdale's character is composed primarily from its multiculturalism; with several cultural neighbourhoods along its major paths. Danforth Avenue (commonly referred to as "The Danforth" in Greek Town) has a high concentration of Greek restaurants while Gerrard Street East and parts of Broadview Avenue are home to a variety of Asian shops and restaurants (referred to as East Chinatown). South of Queen Street East are several large corporate film studios extending down to the waterfront. Riverdale is home to the Gerrard Square Mall; which features a variety of retail, restaurant, and small shops. The neighbourhood's character is also defined by the CN Railway, which separates the area into two districts, North Riverdale (north of the tracks) which is primarily residential (for the exception of Gerrard Square Mall and The Danforth and South Riverdale (also known as the Riverside District) (south to Lake Shore). There are four Toronto-based school boards that provides public education for the city, including the neighbourhood of Riverdale. Two of the four Toronto-based school boards teach primarily in English, the secular Toronto District School Board, and the separate Toronto Catholic District School Board. The institutions operated by the other two Toronto-based school boards, the secular Conseil scolaire Viamonde (CSV), and separate Conseil scolaire catholique MonAvenir (CSCM), are a French first language public school board. However, CSV does not operate a school in Riverdale. Both CSCM and TCDSB operates one public elementary school in Riverdale. CSCM operates, École élémentaire catholique du Bon-Berger, whereas TCDSB operates Holy Name Catholic School. Holy Name was founded in 1913 by the Sisters of St. Joseph with four classrooms. Eight more classrooms were added in 1918. In 1931, two more portables were installed and 8 room addition was built in 1949 totalling to 20 classrooms. To service the ever-increasing population an annex was built in 1957 and extended in 1961 to provide a total of 31 classrooms but it was joined to the main building providing a library, a gymnasium and several more classrooms in 1968. Holy Name is a feeder school for graduates who would later attend St. Patrick, Neil McNeil and Notre Dame secondary schools, all of which are located outside Riverdale. Riverdale Collegiate Institute is a public secondary school operated by the Toronto District School Board. TDSB is the only school board that operates a secondary school in the neighbourhood, Riverdale Collegiate Institute. In addition to the secondary school, TDSB operates City Adult Learning centre, one of five Toronto District School Board adult learning centres serving the area. The building was built in 1964 as "Parkway Vocational School" as a vocational school, which traces back to "Jarvis Junior Vocational School" as an extension to Jarvis Collegiate Institute. Parkway was later renamed to "Parkview Secondary School" and was closed in 1983 due to low enrolment. "Quest Alternative School" is the area's original alternative middle school, and one of the first in Toronto. Consisting of 68 students and 4 staff, Quest celebrated its 25th anniversary in 2008. The school's motto is: "Structure to learn and freedom to grow", and its focus is on student-centered learning and diverse curriculum. In addition to public schooling, Riverdale is home to private school as well. Montcrest School is located on Montcrest Boulevard and several houses on Broadview Avenue just north of Riverdale Park. The school has been in operation since 1961, previously operating under the name "The January School". Riverdale is in the provincial riding of Toronto—Danforth, and is currently represented in the Ontario provincial parliament by Peter Tabuns, deputy leader of the Ontario New Democratic Party. Municipally, Riverdale is in Toronto Ward 30, represented by Toronto city councillor Paula Fletcher. Federally it is represented by Julie Dabrusin of the Liberal Party of Canada. 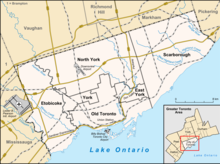 Provincially, the riding was known as Riverdale from the 1914 Ontario provincial election until the 1999 Ontario provincial election when the number of provincial ridings were reduced and given the same borders and names as federal ridings, in this case Broadview—Greenwood and, more recently, Toronto—Danforth. In all its guises it has elected a New Democrat in every election since 1963. In 1964 a by-election set the model for future NDP campaigns. Under the campaign management of Gerald Caplan, Stephen Lewis, and Marjorie Pinney the NDP canvassed every household three times, identified all their supporters, and then they got out the vote. This strategy is also known as PIG, Persuade, Identify, Get out the vote. Lawyer Jim Renwick won with 7,287 votes compared to 5,774 votes for the Conservatives and 5,771 votes for the Liberals. Federally the riding, known for many years as Broadview and then Broadview—Greenwood, has been represented by New Democrats from 1962 (the first federal election after the party was formed) until 1988, when Liberal Dennis Mills won the seat. Mills held the riding until 2004, when NDP leader Jack Layton won the seat. View of Riverdale Park, one of three municipal parks located in Riverdale. There are three medium to large sized parks in Riverdale. At the west edge between Broadview Avenue and the Don Valley Parkway just north of Bridgepoint Health is Riverdale Park. This park features a running track, three baseball diamonds, a skating rink, a public swimming pool and tennis courts. Just to the east of Riverdale Park is Withrow Park which has a large off-leash dog area, an ice rink, two baseball diamonds, play structures, and a soccer field. In South Riverdale is Jimmie Simpson Park which contains tennis courts and a community centre. In the southwest corner just north of Queen St. East on Broadview Avenue is the Royal Canadian Curling Club. The curling club features six sheets and hosts leagues for about 500 members. The last park in Riverdale located further east along Blake Street is Kempton Howard Park (formerly East View Park) and was renamed in 2007 in honour of a youth worker who was killed in 2003 in the Blake/Boultbee community in which he lived and worked. Hubbard Park located next to Riverdale Library is named for William Peyton Hubbard. These three parks serve as great landmarks within the neighbourhood that many residents use for various activities, from swimming in outdoor pools to tobogganing down the steep hills in Riverdale Park during the wintertime. These are the most common outdoor spaces within the area and according to Toronto's Official Plan, are to be preserved as an area of green space in the years to come. De Grassi Street is a notable street in "Lower" Riverdale. ^ "Annexation Map, 1915". From Report to the Civic Transportation Committee on Radial Railway Entrances and Rapid Transit for the City of Toronto Volume II. City of Toronto. 1915. Retrieved September 19, 2016. ^ "Neighbourhood Profile: Riverdale" (PDF). City of Toronto. ^ Withrow Avenue Junior Public School, Withrow Avenue Junior Public School. "Withrow Avenue Junior Public School". Withrow Avenue Junior Public School. Withrow Avenue Junior Public School. Retrieved 2011-09-14. ^ Jackman Avenue Junior Public School, Jackman Avenue Junior Public School. "Jackman Avenue Junior Public School". Jackman Avenue Junior Public School. Jackman Avenue Junior Public School. ^ Frankland Community School, Frankland Community School. "Frankland Community School". 23/09/16. ^ "Montcrest School History". Montcrest School. ^ "New park honours groundbreaking black Toronto politician William Peyton Hubbard - CBC News".